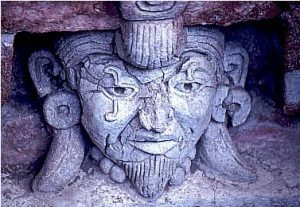 The Zapotec civilization, like the Maya, grew up in the region that had been ruled by the Olmec, after the collapse of Olmec power about 500 BC. The main city of the Zapotec kings was Monte Alban (in modern Mexico). The Zapotec developed their own hieroglyphic writing system, possibly building on earlier Olmec writing. They invented the slow wheel for pottery, and started using coal for fuel. They built large stone temples and ball courts. People lived in stone houses held together with mortar. The Zapotec tried to build peaceful relationships with their neighbors, the Aztec and the Maya. There were Zapotec ambassadors at the Aztec court at Tenochtitlan, and Aztec ambassadors at the Zapotec court. But the Zapotecs and the Aztecs often fought wars anyway. They wore padded cotton armor. There was a big war between the Aztec and the Zapotec between 1497 and 1502, where the Aztec king Ahuizotl fought the Zapotec. The Zapotec king Cosijoeza still controlled his territory when the Spanish invaded Central America in the early 1500s. Cite this page: Carr, K.E. Who were the Zapotec? Central American history. Quatr.us Study Guides, September 9, 2017. Web. April 25, 2019.